Scientists Seppo Mattila and Miguel Pérez-Torres have obtained photographs of the process of the star being absorbed by a supermassive black hole in one of the nearby galaxies. The event was accompanied by an extremely interesting phenomenon, known as jet – a collimated stream of plasma thrown out of the poles of the galaxy's or star's nucleus at relativistic speeds. For the first time in history it was possible to obtain such detailed images of jets and their changing structure over time. These two astronomers focus on the search for supernovae in the Universe. A galaxy similar to the Milky Way experiences one supernova explosion every 50 to 100 years. This is not a very large number and that is why the main place of the supernova searches turn out to be starburst galaxies, in which these powerful explosions are observed once every 3-4 years. In January 2005, astronomer Seppo Mattila of the University of Turku, Finland, observed a collision of galaxies called Arp 299, some 146 million light years away. He then discovered a bright flash of infrared light, a source of which was located near the centre of one of the galaxies involved in the collision. Then, Miguel Pérez-Torres of the Instituto de Astrofísica de Andalucía in Spain noted a clear source of radio light in the same place, conducting separate research into a supernova. The scientists decided to form a joint team of researchers to investigate the source of the emissions. During 10 years of research, scientists concluded that a radio emission source extends into a structure similar to a jet and moves at a speed close to the speed of light. It was then that scientists realized that the phenomenon they were investigating was a tidal disruption event (TDE), which was even 1000 times less frequent than the supernova ones. The phenomenon of tidal disruption, which was the source of the jet registered by scientists. 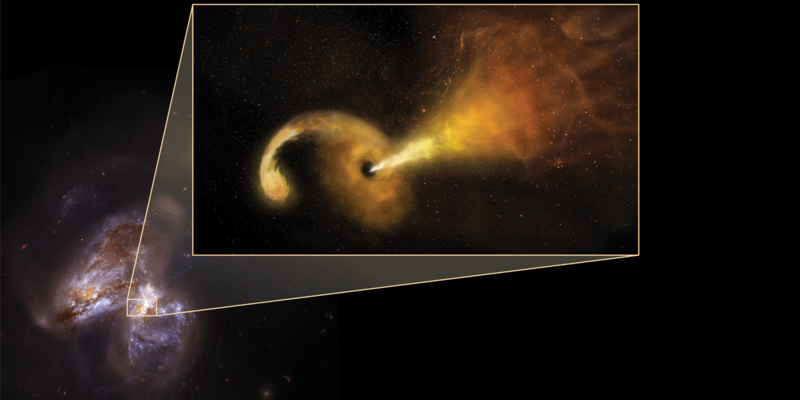 Tidal disruption is an astronomical event that occurs when a star comes close enough to the horizon of a supermassive black hole and is torn apart by the tidal forces of a black hole, experiencing so-called "spaghettification". It's not the first time that scientists have observed a jet as a result of tidal disruption, but for the first time it's close enough to get detailed pictures and explore the structure of the jet itself.